Thursday, Nov. 29 - Travel Day. Depart ATL for MUC at 4:50 pm on Delta #130. Friday, Nov. 30 - Arrive in Munich at 7:00 am. Bus to Augsburg. Check into Hotel Ibis (10:00 am). Walking tour of Augsburg (Haupt) in afternoon. Dinner Augsburg Hauptbahnhof Brauhaus. Visit Christmas Markets in evening. Saturday, Dec. 1 - Bus to Rothenburg ob der Tauber. Visit Christmas Markets. Dinner in Rothenburg. Bus back to Augsburg and stay at Hotel Ibis. Sunday, Dec. 2 - Bus to Chiemsee and see King Ludwig's Palace at Herrenchiemsee. Bus to Berchtesgaden Region. See Koenigssee. Dinner in the town of Berchtesgaden. Bus to Freilassing. Check into Hotel Krone in Freilassing. Monday, Dec. 3 - Bus into Salzburg, Austria. Walking Tour (Haupt). Visit Christmas Markets. Dinner at Stiftskeller-St. Peter. Bus to Freising (bei Munich). Check into Hotel Lerner. Tuesday, Dec. 4 - Bus into Munich. Short walking tour of Munich (Haupt). Visit Christmas Markets at Marienplatz. Dinner in Hofbrauhaus. Bus to Freising and stay at Hotel Lerner. Wednesday, Dec. 5 - Bus to Munich airport at 7:30 am. Depart from Munich for ATL at 9:50 am on Delta #131. For this tour you must have your passport by Oct. 22 or have applied for one by that date. $1840.00 ground costs (based on total of 10 travelers) in US dollars. If fewer than 10 travelers then: total = $1970.00 if 9; total = $2170.00 if 8; total = $2420.00 if 7. Per person costs will come down further if more than 10 travelers. minimum 7 travelers - maximum 26 (but flexible). If fewer than 7, may convert to use of train travel instead of bus travel - hotels will change as well as costs. This cost is based on the current US Dollar - Euro exchange rate: Dec 2, 2018 of 1.14 USD = 1 Euro. Cost includes: Lodging (2 per room); Bus Transportation (5 days), all admissions, overhead and taxes; and all meals ($40.00 max per day). RT Flight portion ATL-MUC: estimated at $1447.00 as of Dec 2, 2018 (includes all flight taxes and a $30.00 fee to Starr Travel). Total "on-the-ground" miles traveled = 500 miles. Final 1/2 of "on-the-ground" costs: due by November 10, 2018. Monday, Dec. 10 - Travel Day. Depart ATL for MUC at 4:50 pm on Delta #130. Tuesday, Dec. 11 - Arrive in Munich at 7:00 am. Bus to Augsburg. Check into Hotel Ibis (10:00 am). Walking tour of Augsburg (Haupt) in afternoon. Dinner Augsburg Hauptbahnhof Brauhaus. Visit Christmas Markets in evening. Wednesday, Dec. 12 - Bus to Rothenburg ob der Tauber. Visit Christmas Markets. Dinner in Rothenburg. Bus back to Augsburg and stay at Hotel Ibis. Thursday, Dec. 13 - Bus to Chiemsee and see King Ludwig's Palace at Herrenchiemsee. Bus to Berchtesgaden Region. See Koenigssee. Dinner in the town of Berchtesgaden. Bus to Freilassing. Check into Hotel Krone in Freilassing. Friday, Dec. 14 - Bus into Salzburg, Austria. Walking Tour (Haupt). Visit Christmas Markets. Dinner at Stiftskeller-St. Peter. Bus to Freising (bei Munich). Check into Hotel Lerner. Saturday, Dec. 15 - Bus into Munich. Short walking tour of Munich (Haupt). Visit Christmas Markets at Marienplatz. Dinner in Hofbrauhaus. Bus to Freising and stay at Hotel Lerner. Sunday, Dec. 16 - Bus to Munich airport at 7:30 am. Depart from Munich for ATL at 9:50 am on Delta #131. 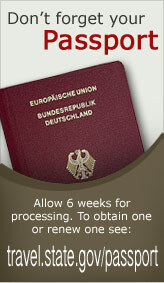 For this tour you must have your passport by Nov. 5 or have applied for one by that date. $1840.00 ground costs (based on total of 10 travelers) in US dollars. If fewer than 10 travelers then: total = $1970.00 if 9; total = $2170.00 if 8; total = $2470.00 if 7. Per person costs will come down further if more than 10 travelers. minimum 7 travelers - maximum 26 (but flexible). If fewer that 7 travelers, then may convert to use of train travel instead of bus travel - hotels will change as well as costs. Final 1/2 of "on-the-ground" costs: due by November 28, 2018.